Effective tools take much of the ‘work’ out of the job. 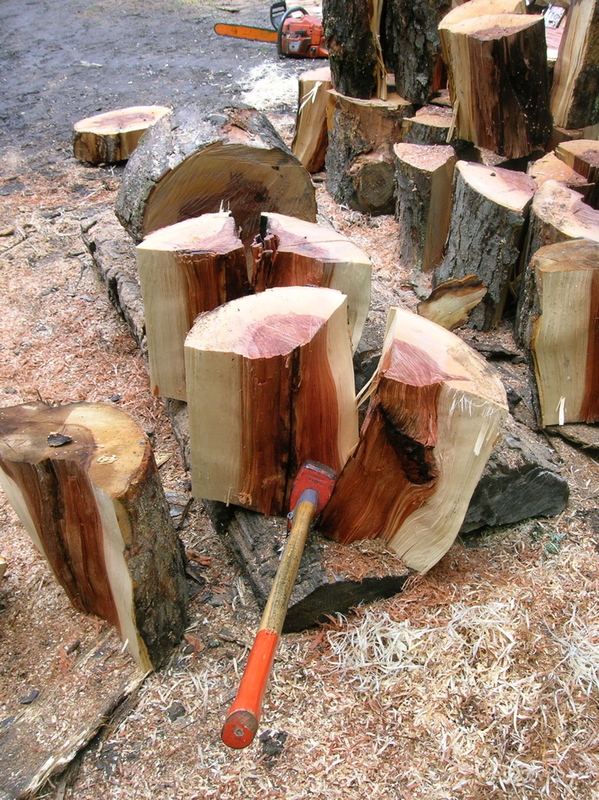 While the bulk of the work is done with the processor, anything crooked or larger than 13″ in diameter is broken up with chain saw, maul, and small splitter. I built the small splitter as a combination horizontal/vertical, but I don’t much care to flip flop the beam for larger stock. It seems more effective to break anything too large to lift, and then use the splitter in the horizontal mode. The smaller saw is one of a pair of 357xp, and the larger is a 371xpg. The ‘g’ indicates heated grips. Both were found on Craigslist: I got totally hosed on the 357, but then scored on the 371, which suggests there may be some sort of cosmic balance to the universe. 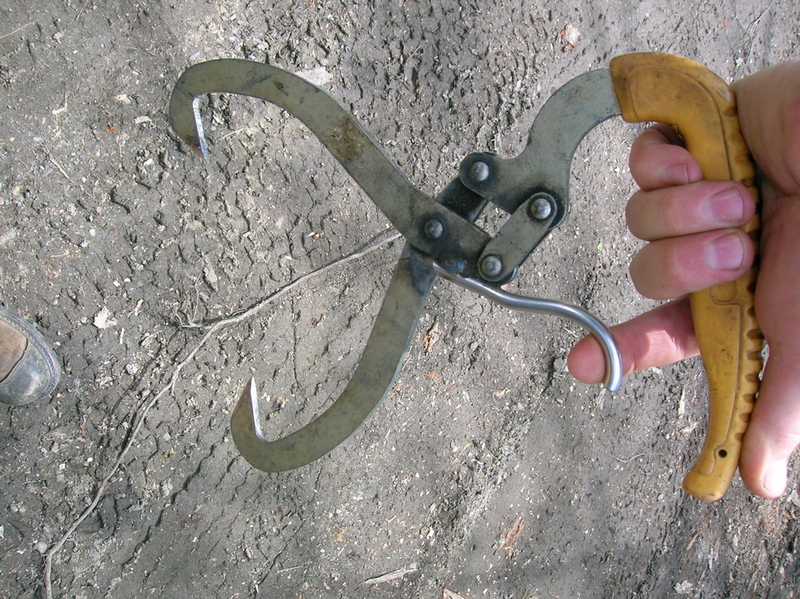 Prior to buying a set of these, I would lift larger blocks with either one or two pulp hooks. Tongs are far more effective, in that you can latch onto a block and swing it around with much less effort/muscle involvement, and from a better postural standpoint. First, the tips were square cut, and barely grabbed the wood, so I ground and filed to shape. Second, I added the trigger. 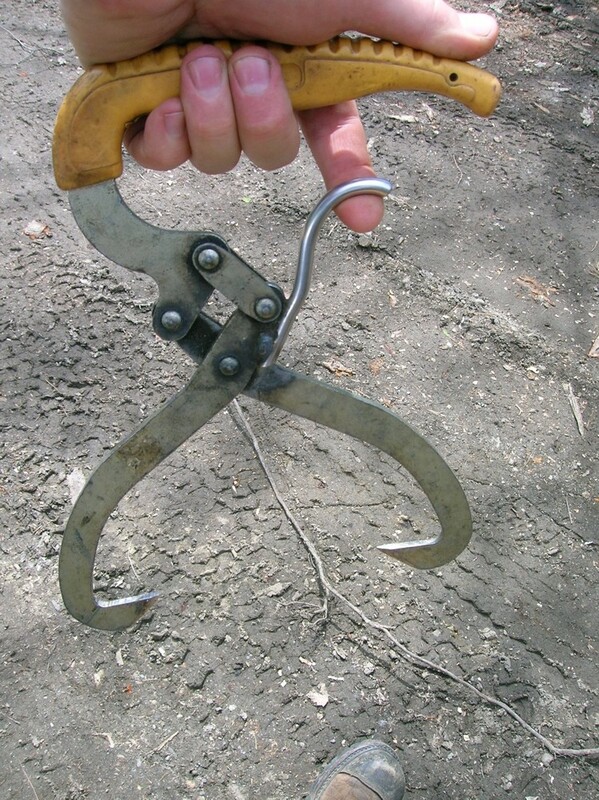 This is terribly effective, in that now the tongs can be opened or closed at will with a deft touch. The tongs serve as an effective go/no go gauge, in that if I can’t grab a block with the tongs, I shouldn’t be lifting it. 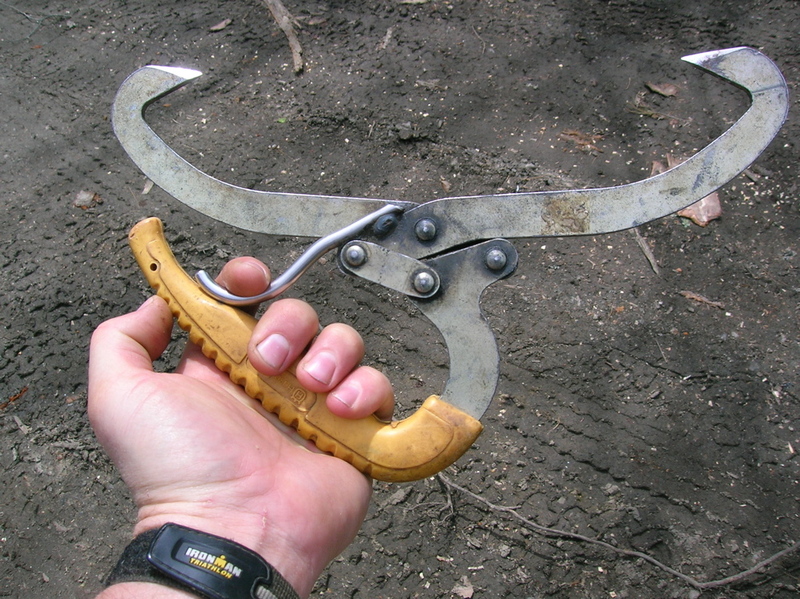 A video clip of tongs in use on larger blocks. 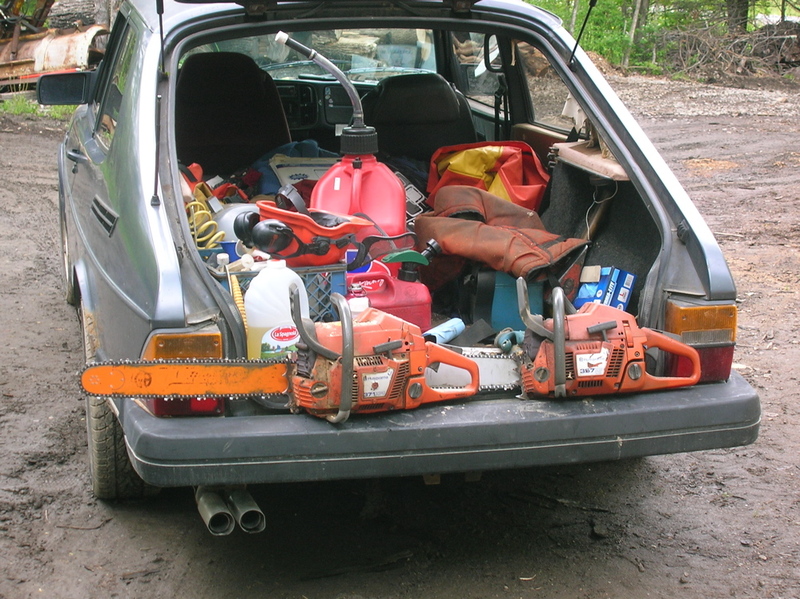 Manufactured for Stihl by Iltis-Oxhead. The latter has been forging since 1781. If you buy the Oxhead branded maul, it will come with a reinforced collar below the head. This red oak is close to 20″ in diameter, which is a bit more than I want to fling around. 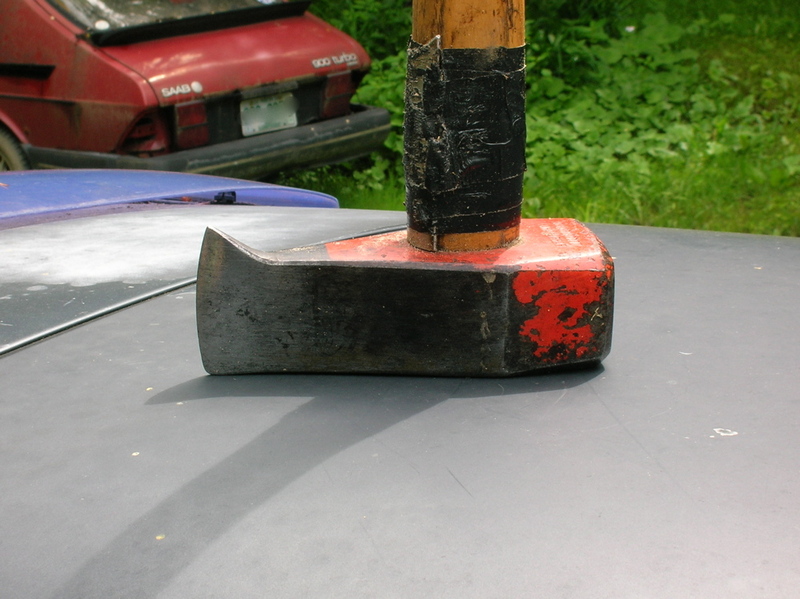 The practice then, is to halve (or quarter) with the maul. 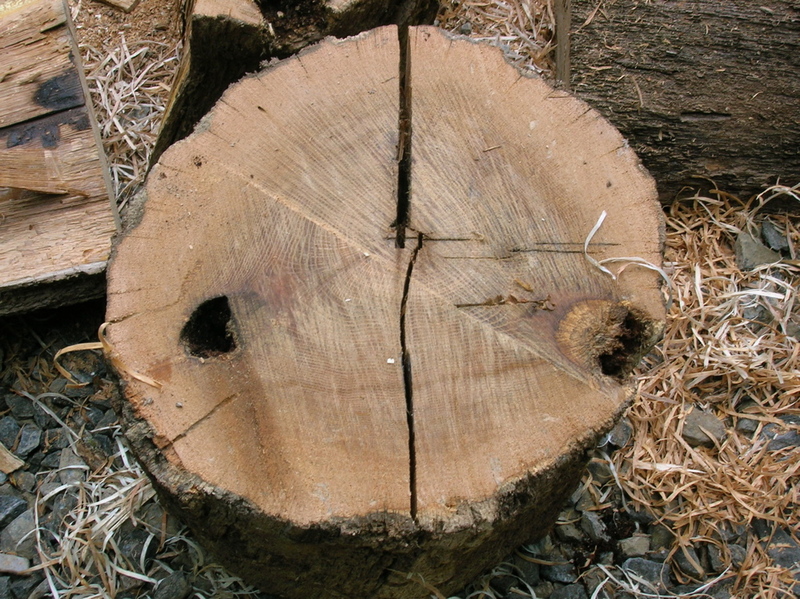 If the block is twisted or knotty, I will make a partial cut with the saw to make splitting easier. The Stihl maul has two nifty features: The shape of the head lets you stand it upright, and the hook on the working edge can be used to flip a block upright, much like using a hookaroon. 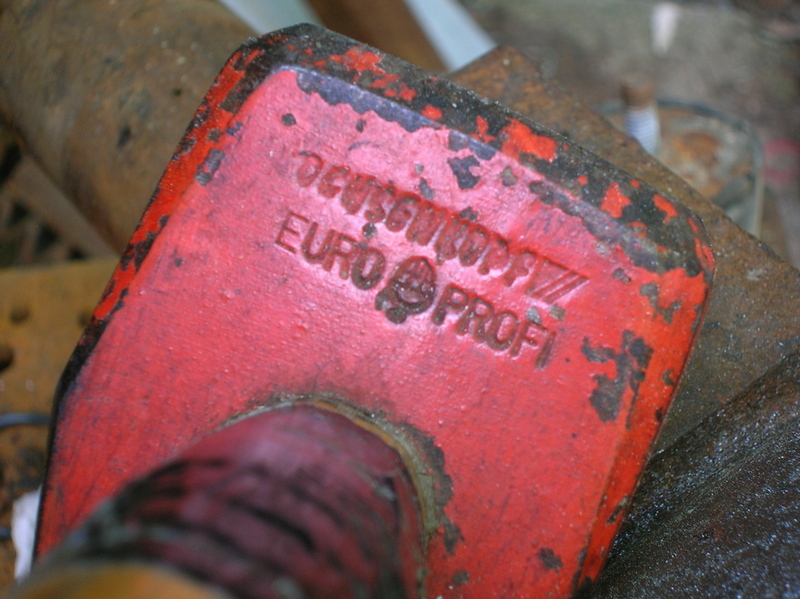 To the negative, the shaft has no protection below the head. Invariably, the handle will catch on the edge of the block while passing through the split, and over time, the handle takes a beating. I have temporarily taped a section of stainless tube stock to the impact zone. Oooh, the colors! (A black birch). 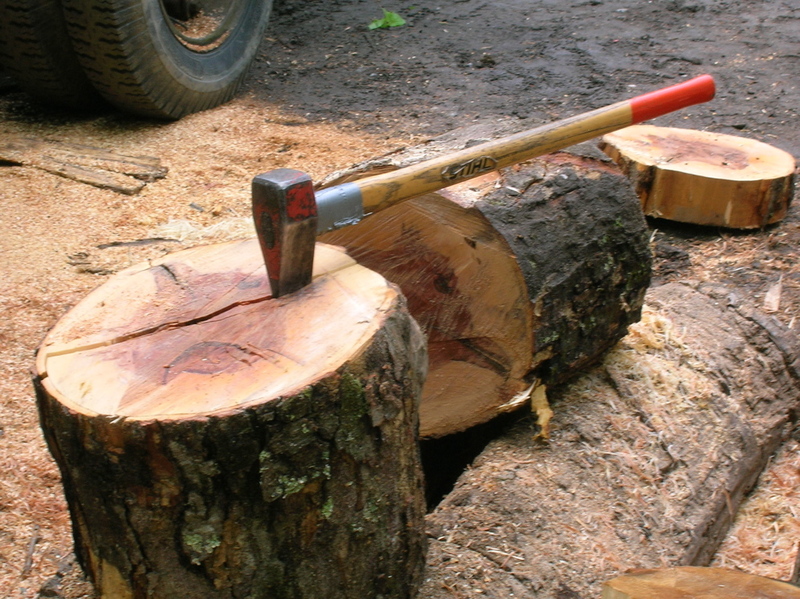 At some point I would like a Gransfors splitting axe, for recreational use. Iltis on left, Gransfors on right. A Christmas gift for a deserving friend. A little Woody Guthrie goes well with block mauling. (Sound quality isn’t very good on this clip, but you get the idea). This isn’t really a hand tool, but for the moment it’s stayin’ here. A view from the ‘safer’ side. 16hp B&S direct coupled belt drive. Simple and effective. This turned up late in the spring of ’11. I towed it back from Franconia behind the SAAB (on a utility trailer). It turns out, the previous owner is good friends with the man who cleans our chimney. 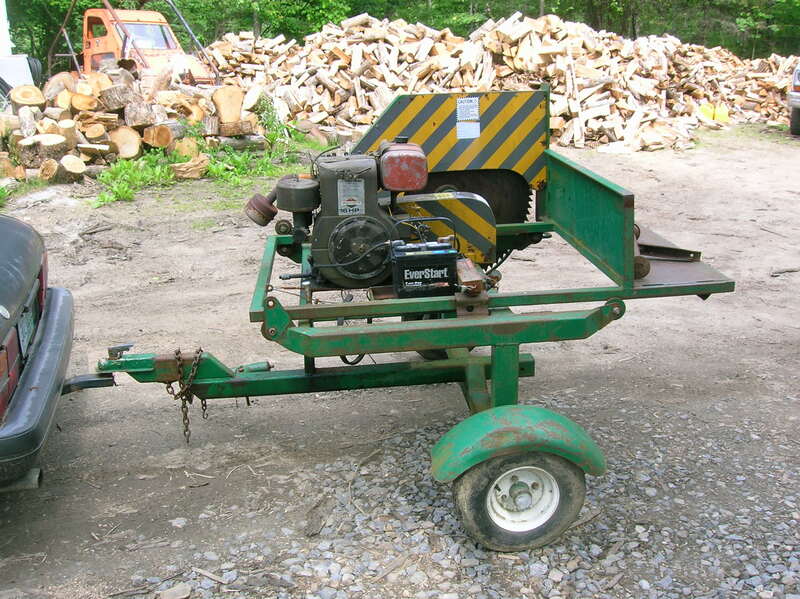 We have had a cordwood saw, driven off the back of the 8n, seemingly forever . I think the tractor either came with one, or my father bought one in the early ’70s. The original was driven off a flat belt. Not the safest tool in the shed, but that is how many implements were powered way back when. That rig was traded in for a new one, driven directly from the PTO with a shaft. 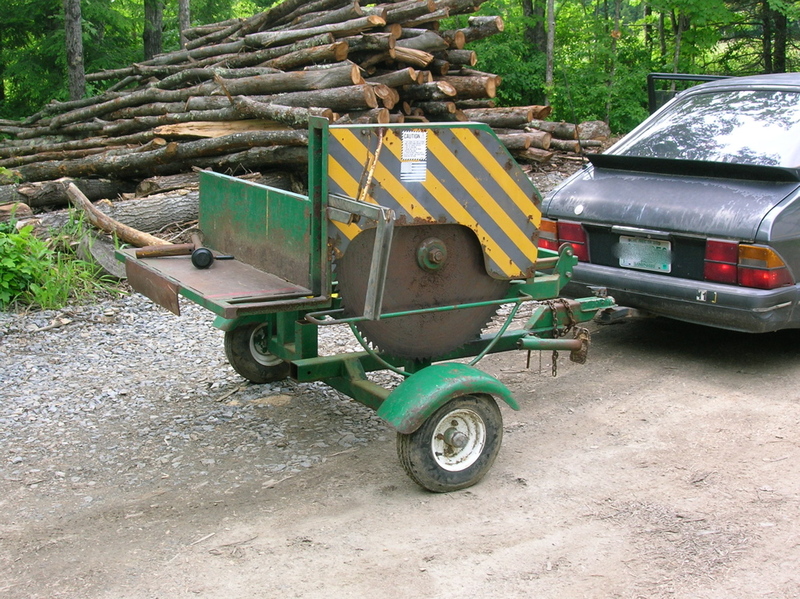 We still have the second saw, and it works well, but it’s annoying to mount it, it won’t stand up by itself when not on the tractor, and you can’t very well cut wood into the tractor bucket while sawing. The LaFont, on the other hand, is self contained, won’t tip over, and uses less fuel than the tractor. The table is also quite a bit wider and has better bearings, so it is much easier to balance a longer, heavier piece of work. 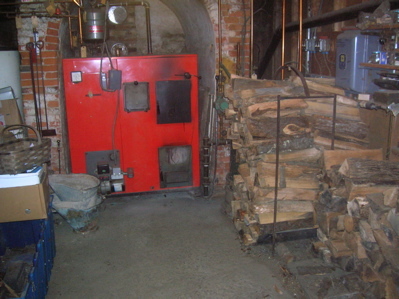 Until I hook up the solar hot water heater, the domestic hot water in the summer requires a fire in the boiler. With the LaFont, it’s no big deal to snip up a carry of stove wood for a quick heat. One of the reasons the previous owner opted to sell, was that he felt the saw was just a bit ‘too dangerous’. The guarding on the blade is better than most, but not as good as many european models. 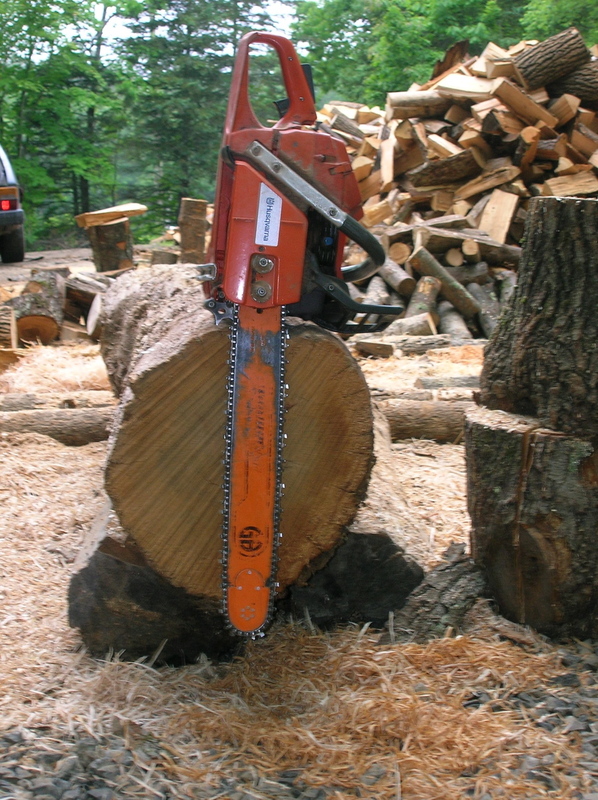 When the cut pile gets too big, it can topple back into the lower part of the blade. That will be remedied in short order with a piece of expanded metal. The length stop made of Uni-Strut allows for consistent sizing with the operator at the far end of the table. 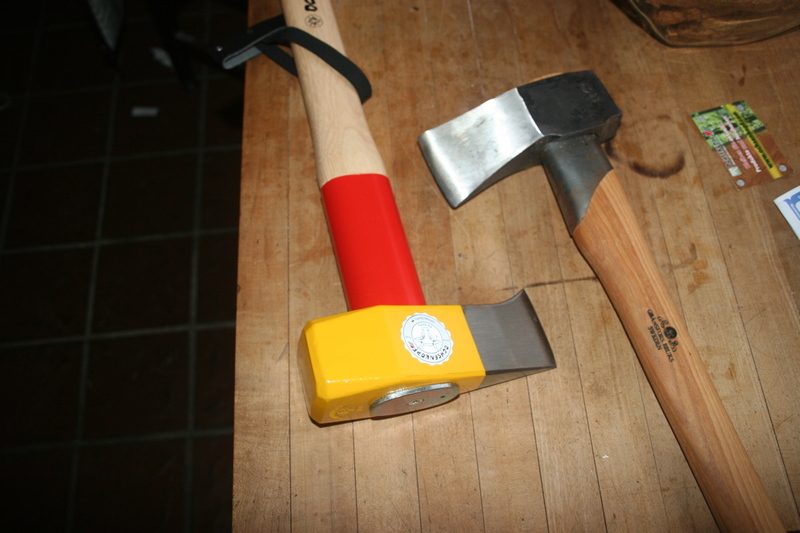 It is worth mentioning that these things are less threatening, and a joy to use when the teeth are properly sharpened. (11/8/12) I was informed recently that the gentleman charged with sharpening my blades has passed on. A shame, as he was a nice guy who carried on a lost art learned from a previous generation.